Vintage Boyd's Frosted Pale Yellow with Red bottom Turkey on Nest 2.5"
New ListingUranium Vaseline glass car by Boyd mint cond. Very cool little Vaseline glass car. Boyd Glass of Cambridge, Ohio made this Cobalt Swirl Pooche color #113 in August 1997. There is only one line on the bottom of the B, which dates it to (1984 - 1988). Estate sale find, excellent condition. This is aCHICK SALT from Boyd Glass in the colorSATIN FANTASIA BLUE. The interior of the basket carries the famous Boyd diamond B logo with 4 lines. This is color number 175 of the chick salt series with a production date of 11-21-2000. This is aCHICK SALT from Boyd Glass in the colorSATIN FANTASIA. The interior of the basket carries the famous Boyd diamond B logo with 4 lines. This is color number 174 of the chick salt series with a production date of 11-7-2000. 2” Boyd Glass Hen On Nest Salt. #40 Vacation Swirl. Made 6-22-1982. First five years 1978-1983 (no lines). No chips, cracks, or flaws. Boyd Glass of Cambridge, Ohio made this Candy Swirl Pooche color #34 in May 1980. The Boyd Bunny in the photos were taken in natural light. I believe the colors are Country Red and Waterloo or Windsor Blue, though I am not an expert on Boyd colors. 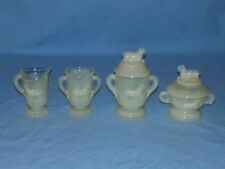 All of them except the front one (white milk glass ) is made by Boyd. what you do see in pictures is the actual item that you will be getting. This is a nice pink glass kewpie doll. Slag Years 1983-1988. Daffodil New Mark #4-Hollow Elephant. Daffodil 01-30-1984. Daffodil 01-30-1984. Crystal 06-25-1984. This is aCHICK SALT from Boyd Glass in the colorPURPLE VALOR. The interior of the basket carries the famous Boyd diamond B logo with 4 lines. This is color number 182 of the chick salt series with a production date of 11-05-2001. It is color number125 with a production date ofFebruary 8, 2000. He is vaseline glass swirled with cobalt glass. He glows like a firefly under a black light! The Iridescence is subtle and the swirly yellow color takes on the “Sun Glow” when you hold it to the light. Sunglow Carnival was #6 of the 59 colors in the Lamb Salt and was made on 3-19-90. This is a nice 2 piece cobalt blue glass salt cellar/dip in the shape of a hen. This 1983 guy is made of slag glass and is in perfect condition. This is a beautiful Boyd Crystal Art GlassWILDFLOWER Covered Candy Dish in Glowing VASELINE. Put it under a black light and it glows like a firefly. 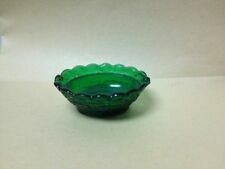 You can use it as a candy dish, for trinkets, or just for display in your vaseline glass collection. You decide. Study all of her pictures closely. She is magnificent. Marked with the B inside the 3 sided Diamond on the inside. Dates her from 1993-1998. IN HELIOTROPE. Pictures were taken in natural outdoor light. Boyd Glass of Cambridge, Ohio made this Intrique Pooche color #134 in June 2001. Boyd Glass of Cambridge, Ohio made this Sea Mist Swirl Pooche color #169 in August 2007. B IN DIAMOND MADE 1st FIVE YEARS. It is orange with a lighter butterscotch color in spots. There is no mold list on the Boyd Website for Kitten on a pillow but I have seen an unofficial list and it shows them being made from 12-22-78 to 11-3-82 in 46 different colors. Translucent Green Scottie Scottish Terrier Small Glass Dog Figurine Boyd? Unmarked though we think his is likely by Boyd. We are human and occasionally will make errors. UP FOR CONSIDERATION IS THIS VASELINE TWO PIECE DRESSER BOX. IT IS IN PERFECT CONDITION. 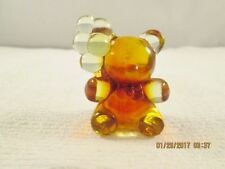 #2406 FOR YOUR CONSIDERATION IS THIS BOYD ART GLASS PATRICK BALLOON BEAR. We research & inspect every item; they are sold as is & are described to the best of our ability & knowledge. All of the photos are of the actual item you will receive. The Joey Horses were made in 82 colors between 3/12/80 and 12/12/94. Boyd glass then permanently altered the Joey mold to make Taffy the Carousel Horse, making the Joey horses (and Little Joes) fairly unique in the art glass industry. Vintage Boyd's Frosted Pale Yellow with Red bottom Turkey on Nest 2.5". Shipped with USPS Priority Mail. Boyd Glass Collectible Opalescent White Crystal Art Business Card Footed Box! The pattern looks to be like Berries and Leaves! 2 1/2" by 3 1/4" by 1 5/8". We call the color an Opalescent White! Marked on the bottom with a "B" in a diamond and "lines" on 3 sides. Give as a gift.keep it! 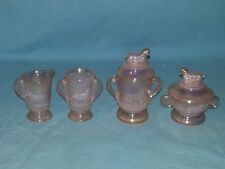 3 VINTAGE BOYD SALT CELLAR SHEEP / LAMB ON NEST PINK. MINT CONDITION. Condition is Used. Shipped with USPS First Class Package. The Hen half of the dish has a clean smooth rim or lip that fits neatly on top of the nest base – no rough,raised or jagged edges. STYLE : 2-Piece covered dish depicting a hen on her nest. MANUFACTURER : Boyd, marked with “B” inside a diamond. MADE OF SOLID GLASS. IT IS 3" HIGH AND 2-3/8" WIDE. 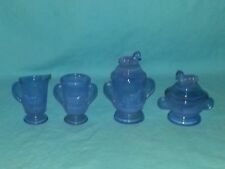 Lot Of 2 Boyd Glass Duke Scottie Dog Cobalt & Carnival. What you see is what you will receive. 2 boyd Scottie dukes. One cobalt and one carnival. This is done in a topaz, greenish yellow coloring on the Grape & leaf design. Originally, it was an Imperial Glass design and had #1950-201 in the catalogs. I don't know the age-era when this item would have been made. Lovely Hen on Nest, Boyde #145 made in 2001. Marked with the B inside the 4 sided Diamond on the inside. UP FOR CONSIDERATION IS THIS BOYD HAND PAINTED TURKEY SALT. IN PERFECT CONDITION. Peacock Blue is a perfect color for Boyd's Bunny Nest covered salt. It stands 1-3/4" tall. The interior of the basket carries the famous Boyd diamond B logo with 4 lines. This is color number 105 of the Bunny Nest Series with a production date of June 21, 1999. Boyd Glass of Cambridge, Ohio made this Sugarplum Pooche color #17 in April 1979. THIS IS A ARUBA SLAG COLOR . BROUGHT DIRECTLY IN THE FACTORY 2000. BOYD ART GLASS FACTORY HAS CLOSED. THIS IS A RETIRED COLOR. THERE ARE 4 DIFFERENT VARIATIONS OF ARUBA SLAG, I FOUND ON THE INTERNET UNDER POOCHE BOYD COLORS THAT SHOWS ALL 4 ARE CONSIDERED ARUBA SLAG. VINTAGE BOYD # 19 SPRING BEAUTY GLASS JENNIFER DOLL 3.5"
VINTAGE BOYD LILAC GLOSS GLASS JENNIFER DOLL 3.5"